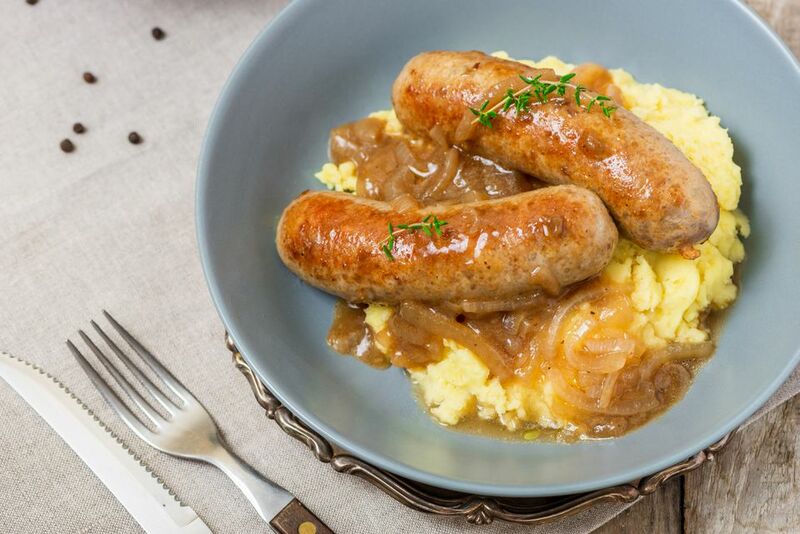 Bangers and Mash is the familiar term for Sausage and Mash, a favorite British and Irish dish. The name bangers is believed to come from the habit of sausages bursting in the pan with a bang if cooked too quickly. Bangers and Mash is quick and easy to make, and also makes a cheap yet very substantial meal. A great favorite with children. Where once it was only possible to buy beef or pork sausages, there are now many different flavors available, from spicy through to fruity. First, start by making the gravy. Melt the oil and butter in a large saucepan over a gentle heat. Add the onion and cover with a lid. Cook slowly for approximately 10 minutes or until the onions are soft. Add the sugar and balsamic vinegar to the onions and stir well. Cover with the lid and continue to cook for a further 5 minutes. Add the stock and boil gently uncovered for 5 minutes. In a heatproof jug or bowl mix the cornstarch/flour with the cold water to a thin paste. Pour a little of the hot gravy into the starch mixture and mix thoroughly. Pour the starch mixture back into the gravy, raise the heat to high and boil for 10 minutes or until the gravy is slightly thickened. Keep warm until ready to serve. Meanwhile, start the mashed potato by boiling the potatoes in lightly salted water until soft. Drain, and keep warm until ready to mash. While the potatoes are cooking, cook the sausages. Heat the oil in a large frying pan, turn the heat to medium and add the sausages. Fry until the sausages are golden brown and firm, turning them from time to time, about 20 minutes. Once cooked, place in an ovenproof dish and keep warm until the mash and gravy are ready. Finish the mash by placing the milk and butter in the pan used to boil the potatoes, return to the heat and warm gently until the butter has melted. Add the potatoes and mash using either a potato masher, a fork, or a potato ricer. Whip the mashed potato lightly with a wooden spoon. Season with salt and pepper. Spoon the mash onto 4 warmed dinner plates, place two fat sausages on top of the mash, and pour the gravy over the dish. When making your mashed potatoes, make sure that you cut your potatoes into even-sized pieces so that they all cook at the same rate. Put all of the potato pieces in a pot with cold water, bring to a boil, then reduce to simmer until fork tender. The fork should be able to easily pierce the potato without effort. To warm ceramic plates for serving, stack them in an oven for 15 minutes at the lowest possible temperature - like 150 F. Make sure that you use oven mitts when removing the plates from the oven, as you don't want to burn yourself. Also, inform others that the plates are hot. Yorkshire Pudding Drenched in Rich Onion Gravy - Heaven.